This item is great for college students are those moving out on their own for the first time! 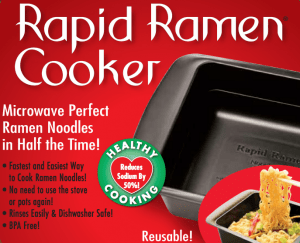 Rapid Ramen as seen on SHARK TANK has teamed up with Fuggs and Foach to do a review and giveaway . I’m always looking for new and different Asian – and Chicken flavors. Chicken is the only one I will eat:) but my son likes beef ..
My kids like the shrimp and the roast beef flavors best. My favorite is the pork. We love chicken flavor here. I like the Oriental and the chicken flavors best. BTW I saw this Shark Tank episode. So cool that they are promoting this here! I like the Oriental flavor. Chicken all the way, all the time! Ramen is a treat in our house. We usually have the chicken flavors. I like the chicken flavor the best! My favorite flavor is Oriental! My favorite is the creamy chicken, but it’s hard to find. I usually stick with chicken flavors, though, because we’re sissies in this house. Who doesn’t love Ramen noodles? I’m especially fond of the chicken ones. I really like all of them though. I like the beef the best. I like the Beef flavor Ramen noodles.